I wanted to share with you a project that has an amazing purpose. It's called Noah's Bandage Project. I heard about through some amazing blogger friends. This past week has brought cancer even more to the forefront of my mind, and so this project hits home. Here's an excerpt from an email I received, "... if you don't know, September is Pediatric Cancer Awareness month. Our next door neighbors lost their little boy, Noah, last June to pediatric cancer - but before he went to heaven, he sure left his mark on the world by starting something called Noah's Bandage Project (http://noahsbandageproject.com/). Quick background: at the young age of 6, while going through his own treatment, [Noah] quickly realized how un-cool it was to just have the boring skin colored bandages all over his body with all the pricks and pokes that comes with treatment for pediatric cancer. If he felt that way, he knew other kids did too. He started a drive to collect fun bandaids (that all our kids love) and distributed them to other kids at Children's Mercy Hospital in downtown Kansas City. What started as a small drive, turned into something much bigger. The KC Royal's got involved, the KC news, etc. While he did end up passing away in June 2015, his family and friends are working hard to ensure this amazing project lives on." 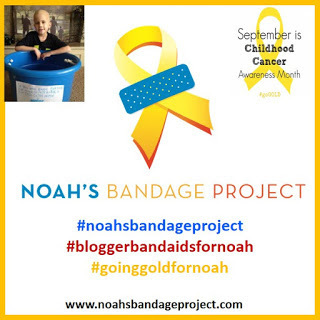 Noah’s Bandage Project has two goals – 1) to help provide cool and fun bandages to kids that need them, and 2) to help raise funds for pediatric cancer research. As a cancer patient, Noah Wilson soon discovered that a bandage is a pretty significant thing. Often times, kids are allowed to hold onto a bandage during uncomfortable procedures, and when they are all done, they get to put the bandage on as a final sign of completion. Once the bandage is on, it means they are through – for the time being. Also, Noah realized that hospital gowns all tend to look the same, and when the chemotherapy makes you lose you hair, even the kids start to look the same. But the bandages you are wearing, those are the cool things that you wear that lets you stand out. The plain old brown bandages get the job done, but they aren’t fun! Noah quickly recognized that the kids that are going through what he is going through, could really use all the fun they can get. That is where Noah’s Bandage Project comes in. He thought, ‘Why don’t we ask if people would make donations so that hospitals could have more cool and fun bandages for more kids?’ So, driven by his new task, Noah created his first sign, got his first tub for collecting bandages, and got to work. Little did he know how big this idea would become. Through Noah’s efforts, his bandage project has helped hospital administrators see the need and importance of increasing their supply of these cool and fun bandages for kids. He’s already helped to provide thousands of bandages to hospitals that were in short supply. These bandages have also been given to families to take home, free of charge! He also realized that these bandages could go to places other than hospitals as well, and has helped provide bandages to many organizations that support kids. With numerous TV, newspaper, magazine, and online interviews and mentions of Noah’s Bandage Project, his simple, yet pure hearted message of wanting to help kids like him have a little more fun in their lives has reached farther than any initially thought was possible. Noah also learned that when it comes to funding cancer research for kids, there is very little support. In fact, only 4% of our national cancer research budget goes to kids… 4%!! So, Noah wanted to help in this area too, and takes money that is donated to his project and turns it into grants for pediatric cancer research. Such an amazing story, right? Henry is 6, and that's the age that Noah passed. I can't even imagine. What an amazing project to carry on Noah's spirit. Lastly, I wanted to thank all of you for your kind comments about my dad and his recent diagnosis with Leukemia. His treatment is going well. Though he has a long road ahead, we are hopeful. Linking up with Idea Box.